This weekend was the annual Los Gatos Christmas Parade. It's a fabulous event for the town to celebrate together and have a great time. It was particularly chilly and wet outside, but we bundled up and walked into downtown. We started the morning with a few celebratory drinks and finished with a gourmet lunch. Not bad for a gloomy day. I really appreciate living in such a beautiful and charming town. I couldn't imagine living anywhere else! I also appreciate my new Rebecca Minkoff handbag courtesy of Stefani Bags. I've been coveting a sleek black handbag for over a year and this one is beautiful. It's the perfect size and the gold hardware suits my style. Stefani Bags has an amazing collection of bags and their customer service is excellent. Take advantage of 25% off your next purchase (excludes pe-orders, CC Skye Onie Messenger and Nirvana bags) or tell a loved one what bag is on your holiday list! Enter Sterling25 at check out. Check out Stefani Bags on Facebook page for even more exclusives! Sounds like a lovely weekend. Didn't it just fly by?! Also, such a perfectly fitting title too. love this outfit esp the Rebecca Minkoff! and the parade looks like so much fun! These photos are so beautiful and full of life! What a perfect black bag! I am a firm believer that you can never have too many classic black bags. So lucky you are to have received such a cute one! Hope you had a fun weekend! Lucky you! :o) I'm sure this bag will go perfectly with many outfits! I love the idea of living in a small town like yours especially when I read about such quaint examples of small town charm! p.s. that's the perfect black bag! absoluteley love the bag! A new bag is on the top of my wishlist right now. You are just looking amazing in all of these photos and it seems to have been a great day. 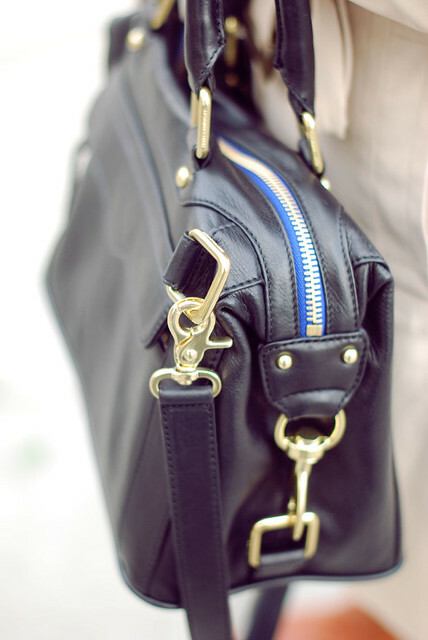 Also the bag is super nice, I always am looking for classic black bags with a twist and the blue zipper just makes it so unique. Such a classic outfit, I love your new bag! Rebecca Minkoff is one of my favorites! I just recently bought her MAC clutch. The bags are so unique and unlike other things out there. Gorgeous photos! I forget that you live in Los Gatos. Love that place. And I love that bag- so perfect and versatile. Love Love This Scarf and those boots..... Loook Uber comfy. What a great weekend you had! I didn't realize we were so close by! I'm in San Francisco and ready for this gloomy rain to be over! Love this bag and the shots with the umbrella- you look fantastic. OMG so jealous of your rebecca minkoff bag!!! sooo cute!! happy monday! Cute outfit and I really like these photos! Thisoutfit would be perfect for the below-freezing temps in Atl today! That is a gorgeous bag. And I love your leopard print scarf. Glad to see an outfit posts! Cute bag!...love the trench and scarf combo. That bag is so awesome. I love the blue zipper. You look so pretty, Taylor! Love the lip color and just looking chic in general! Love that bag, Taylor! It looks great with your winter white coat. I love the LG Christmas parade. Everyone is so happy and the community feeling is the best. LG really is the best town around here. I love this look, you look amazing! 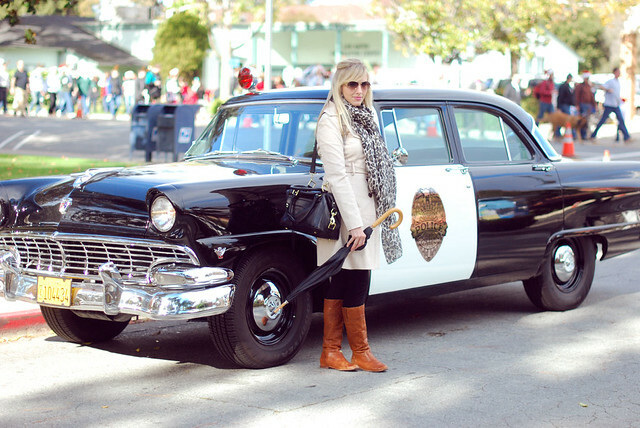 How cool is that pic in front of the vintage cop car?! And loving the trench and scarf. Classic and beautiful. Oooh, I love your trench -- so chic -- and that bag is absolutely beautiful! I love Rebecca Minkoff. I love that bag - I will quickly add it to my Xmas wish list! Have a gerat week, Taylor! LOVE your new bag Taylor! A Christmas Parade sounds like a lovely weekend day! Happy Monday! Looks like so much fun, such a cute post! Making me Christmas more than ever-- I love this holiday and the parades/ festivities that go along with it!! GREAT bag!!! You look fab! Thank you so much for your comment, Taylor! This outfit is so classic and gorgeous, and your day sounds wonderful! Great pictures! I love your trench and I love love love your bag! Such a great shape. Beautiful photos. And you're right, that bag is beautiful. I love the bright blue detail. love your outfit Taylor... that jacket! great pictures!! looks like a fun and festive parade! A great option is the Rebecca Minkoff Morning After Mini!! It's got a similar satchel-like shape with the rocker attitude and is more affordable but still good quality. The leather is so soft!! Such a classic, iconic bag with an attitude! !